Nissan Juke-R revealed | What Car? This is the Nissan Juke-R the ultimate compact crossover, according to Nissan. 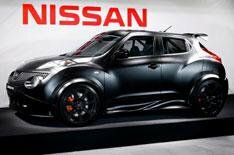 Nissan has revealed two prototype models of the Juke-R, which has the 478bhp 3.8-litre twin-turbo V6 engine found in Nissan's GT-R sportscar. The GT-R's six-speed gearbox and four-wheel-drive system have also been modified and fitted to the car. On the outside, the Juke-R has a sporty, aggressive revision of the current Juke's bodystyling, with flared wheelarches, a split rear wing, 20-inch alloys and new bumpers. There are more GT-R touches inside, with the dashboard dials and LCD display added to the Juke's motorbike-inspired cabin. The Juke-R prototypes were built by leading motorsport outfit RML with input from the Nissan Technology Centre for Europe (NTC-E). Testing of the left-hand- and right-hand-drive Juke-Rs will start next month. Nissan has already said that the Juke-R won't make it into production, but that it might hint at possible future sporty versions.